TIQCon ™ CMM Manager is cloud-based software for storing and documenting data about your CMM. 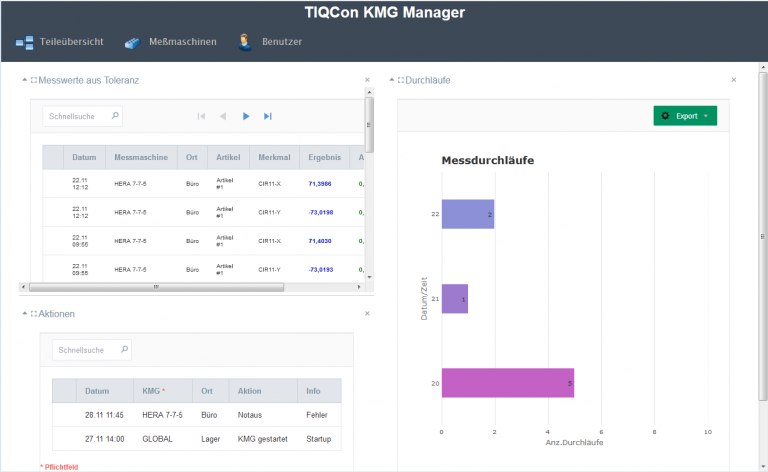 TIQCon ™ KMG Manager stores all the data about your CMM, from the product to test plans, test features, measurement programs, log and action data and measurement results. Furthermore, so-called dashboards are available to always get a current status overview of your measuring machines. TIQCon ™ CMM Manager is constantly being developed and is used for the central organization and documentation of data about your measuring machines. TIQCon ™ CMM Manager is the ideal step stone of an “Industry 4.0” environment. The dashboard continuously informs about features outside the limits, number of measurements per item and current status of the CMM. TIQCon ™ CMM Manager manages all measuring programs, inspection plans and part informations. DMIS Code can be applied directly in TouchDMIS ™ the new age of CMM software. The inspection plan defines all characteristics measured in the respective measuring program, setpoints and tolerances as well as additional information are stored here. Graphic value sequences of each feature can also be called directly here. All data stored in the cloud are subject to the GDPR and are exclusively hosted in our own data centers in Wiesbaden!